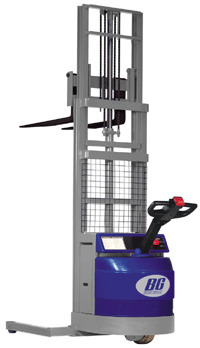 Advanced ergonomics, engineering, materials, and the highest quality electrical, hydraulic and mechanical components are incorporated into the Blue Giant designed Stacker. Other "BGS" features, are adjustable straddles and a programmable electronic travel control. Additional Options: 42" or 48" forks, Flashing red light or beeper - Call ZORIN (888) 378-6525 for details & pricing.